The Ministry of Education and Training has ordered kindergartens across the country to stop offering English programmes in any form, including extra-curricula activities. The reason, according to the ministry, is a need for standard curricula, properly qualified teachers, and the fact that most teaching facilities are poorly-equipped. These shortfalls, it said, would lead to poor teaching methods, such as mispronunciation or incorrect accents, which would do more harm than good. So far, the ministry has yet to issue criteria for teaching English language in pre-schools. 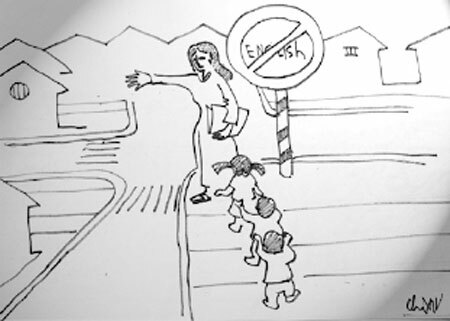 The ban has disappointed many parents whose children are already attending English classes. Nguyen Thu Le, the mother of a pre-school boy in Ha Noi's Nhan Chinh Street, said the ban had deprived children of a chance to learn English, a vital language for the future, at an early age. "Pre-school is a favourable environment for kids to learn a foreign language. They can study via songs and games, and have fun all the time," she said. Bao Nam, her four-year-old son, attended two English classes every week at an international preschool in Ha Noi. He can introduce himself in English, count from one to 10, name some animals and objects and sing several English songs. "My son now is eager to go to school, especially on Monday and Wednesday when English classes take place. He keeps telling me about songs and words he has studied," Le said. "I didn't expect that he would speak with a native accent or have a rich knowledge of grammar and vocabulary," she said. "I just wanted to familiarise him with a foreign language. My son will re-learn it more formally later in life." Le said she would find a good language centre for her son when his class ended. Tran Binh Minh, parent of a five-year-old girl in Ha Noi's Nguyen Luong Bang Street, said early access to foreign languages could have a good impact on children. "My daughter has become more self-confident when talking to my foreign colleagues and even made friends with their kids," he said. According to Minh, most pre-schools offering bilingual classes are located in big cities, where the demand for high-quality English classes was high. A study by University College London among 105 people, 80 of whom were bilingual, showed that being bilingual from an early age significantly altered the brain's structure. Bilingual adults developed denser gray matter (brain tissue packed with information-processing nerve cells and fibres) in the brain's left hemisphere, where most language and communication skills were controlled. The effect was strongest in people who learned a second language before the age of five and in those who were most proficient at their second language, it said. Associate Professor Nguyen Hong Con, head of the University of Social Sciences and Humanities' Faculty of Linguistics, said that a child between two and four years old could acquire a new language like their mother tongue. These two languages might confuse the child sometimes, but they would gradually distinguish them. These children would find it easy to use both languages, much more than older learners. Thus, in his point of view, the more exposure to a new language from as early age as possible was the best with correct studying methods. According to a recent World Bank report on East Asia-Pacific higher education, many higher education graduates have trouble getting jobs due to a shortage of soft skills, of which communicating in English was cited as an example. A restriction on English proficiency and a shortage of other soft skills have made employers hesitate to hire these graduates as they would have to train these graduates to meet work requirements, it said. The Ministry of Education and Training has introduced a project to renovate the teaching and learning of foreign languages within the national educational system by 2020. The goal is for most of students to be able to use a foreign language, especially English, confidently in their study, daily communication and work. According to Con, what and how children would learn and how long a class would take place was the key to the problem. A programme that helped children play and study at the same time - with the support of modern teaching equipment - would bring good results.